How BIG is God? To respond to this question as a Christian, one must reflect on three interrelated doctrines of the faith. 1. Creation or What does it mean to call God creator of the Universe? 2. Providence or What kind of power does God have vis-a-vis the world? 3. Salvation or How does God’s love work in our lives? Theologians across the centuries have pondered these questions, and we have access to their volumes of writings. As we consider these questions today, we humbly join a conversation that has been ongoing for thousands of years. 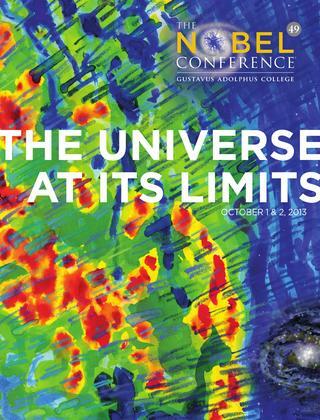 A week from today, Gustavus will host its 49th Nobel Conference, entitled “The Universe at its Limits”. The speakers will address this theme primarily through the lens of science, but some will also engage the big questions about the nature of the Universe through philosophical and theological reflection. As Professor Steve Mellema writes in the program notes, 20th and 21st century researchers have learned about the origins of the Universe by examining the very large – what is “out there”, and the very small – what is “in there”. In preparation for attending my very first Nobel Conference, I spent time reading articles and watching videos in the resources section of the conference website. I was particularly fascinated by Richard Dawkins’ interview with Father George Coyne. Father Coyne, who holds his PhD in Astronomy and is an ordained Jesuit priest and Former Director of the Vatican Observatory, will be one of the presenters at the Nobel Conference next week. Richard Dawkins is both a renowned champion of science and an outspoken atheist. In his many books and frequent TV appearances, he has been rather critical of religion and religious people. In his interview with Father Coyne, Dawkins respectfully asks challenging questions but also seems surprised along the way that he and Father Coyne share a few beliefs about God and the Universe. In Genesis 1, the Bible begins with this claim, “In the beginning, when God created the heavens and the earth, the earth was a formless void and darkness covered the face of the deep, while a wind from God swept over the face of the waters.” During my Lutheran upbringing, people in the church taught me that Christians believed that the God who made the heavens and the earth as described in the Bible was also the God of the whole Universe. And yet, as I have continued to learn about the vastness of the Universe, the Christian story has, at times, seemed rather incomplete. Christian theology is often very earth-centric and human-focused, and yet, many have wondered: What does it mean to relate to a God who is bigger than 100 billion galaxies? Is it really probable to believe that a God who is the God of this whole Universe would only create life on one out of billions of planets? Does it seem in keeping with God’s grandeur that God would only save that portion of the people in the Universe who believe in Jesus from Nazareth as their Lord and Savior? Was God involved in the creation of the Universe or did it come into being on its own? In their interview, Father Coyne and Richard Dawkins agree that God is superfluous; we don’t need God to explain the evolution of the Universe. Dawkins believes that means God does not exist; Coyne says that God’s superfluousness leads him to faith in a God who works within the evolutionary process. In my most honest moments, I find myself somewhere in-between, leaning with hope toward Coyne’s side. While the vastness of God is fun to ponder, it is not an end unto itself. Any discussion of God’s bigness must move beyond thinking about the size of God to wrestle with two more critical and interrelated theological questions. What kind of power does God have vis-a-vis the Universe? and How does God’s love work in our lives? In seminary, I read a book called Omnipotence and Other Theological Mistakes by Charles Hartshorne. In it, Hartshorne challenges the idea that God is an all powerful being who created the Universe out of nothing and can interrupt the laws of nature at will. Hartshorne’s most famous Christian student is John B. Cobb, Jr., who I studied with at Claremont School of Theology. Cobb, a theological and philosophical giant in his own right, was so convinced by the truth of Hartshorne’s claim, that he developed a whole school of Christian theology based, in part, on the rejection of God’s omnipotence. According to Cobb, God’s power vis-a-vis the world is limited by the world’s freedom. So ingrained in the Claremont ethos was this understanding of God’s power, that the phrase ‘Almighty God’ was rarely, if ever, sung or spoken in the Chapel at the seminary. I, too, have come to believe that God does not have the kind of Almighty power so commonly found in many streams of Christian theology. The last two years of my life have been challenging – with a great deal more than usual of grieving. As the pain led me deeper into doubt, I sought out a spiritual guide to be a compassionate listener. Through my participation in a year-long school of love, rooted in the way of Jesus, I encountered a wise soul who pointed me in a helpful direction. “God is small,” he said. “God acts, but in the only way that pure love can act: God is continually present in the world, a living spirit that invades reality at every moment and at every place, that speaks as love does-in whispers, unceasingly-into each and every human heart. God’s whisper may be heard in our dreams, in the voices of our friends and enemies, in the cries of our hearts, in deep silence. Don’t worry so much about the God out there; just try to pay attention for a while to the God in here.” And so it was through this relationship and this experience of focusing, not on the bigness, but on the smallness of God that I found a way back to my own heart. Christian theology has always tried to hold in balance the transcendence of God and the immanence of God. Our tradition teaches us that we can come to know God by wondering about the very large – what is “out there”, and by exploring the very small – what is “in here”. How BIG is God? How SMALL is God? What do you believe? The Rev. Siri C. Erickson is a Chaplain of the College at Gustavus Adolphus College in St. Peter, MN. She is an ordained ELCA pastor and a graduate of Carleton College and Claremont School of Theology.